Located just two and a half hours drive North of Sydney, Mantra Aqua is ideally located in the beautiful town of Nelson Bay, a blue water paradise providing holidaymakers with an abundance of activities to choose from including sea kayaking, surfing, dolphin spotting and whale watching. Mantra Aqua offers a selection of spacious 2 and 3 bedroom self-contained apartments, set around a central lagoon pool and amenities complex. Located in Nelson Bay and offering picturesque views of Port Stephens, Marina Resort offers boutique accommodation just a short drive from the airport. Situated just a short stroll from a number of local beaches, shops, cafes and restaurants, the resort is also close to attractions such as the Nelson Head Lighthouse, Myall Park, Toboggan Hill Park and Winda Woppa Reserve. Offering a great range of onsite facilities the resort is just 45 minutes from Newcastle. Located near the Port Stephens Marina, Marty's @ Little Beach offers open plan, modern accommodation in an enviable located between two of the region's most popular beaches. Close to a range of popular local activities and attractions, the resort is just minutes from Shoal Bay Beach and Little Beach and enjoys easy access to the nearby Shoal Bay Country Club, Nelson Diggers, Mount Tomaree Lookout, the lighthouse, dolphin watching cruises and much more. 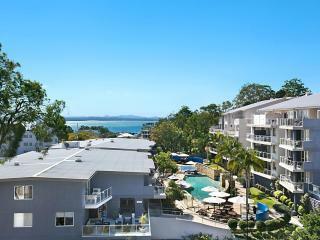 Surrounded by serene bushland just 100m from the beach, Nelson Bay Breeze Resort offers spacious, family-friendly accommodation within comfortable walking distance of the marina, shopping and award-winning restaurants. Home to a great range of onsite facilities, the resort is also close to a range of popular activities and attractions including Winda Woppa Reserve, Nelson Head Lighthouse, Myall Park, Toboggan Hill Park, dolphin watching cruises and more. Oaks Lure offer guests hotel rooms, 1 and 2 bedroom apartments located in the charming town centre of Nelson Bay, with a short walk to the unspoiled waters of Port Stephens, the marina, restaurants and shops. This NSW Coast accommodation is only a 30 minute drive from Newcastle Airport or 2 hours from Sydney. Located in Nelson Bay and boasting views of the park and marina, The Nelson Resort & Conference Centre offers comfortable accommodation close to the local beach. With a convenient range of onsite facilities, the resort is just a short stroll from a variety of local shops, bars, cafes and restaurants. Close to a number of popular attractions, the resort also offers easy access to outdoor activities including swimming, snorkelling and windsurfing.